When I wrote about making paneer at home in an earlier post a lot of you wanted to know how it is done. Since I had not taken pictures that time, I had to wait until I made paneer again, to take some pictures and do this post. 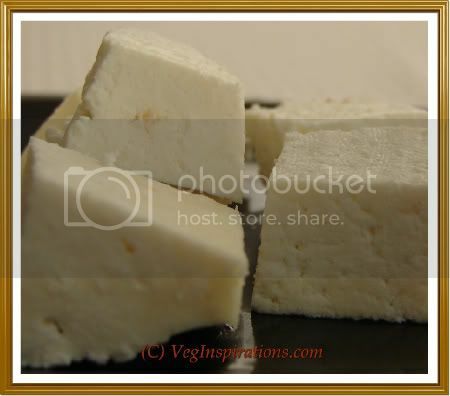 Finally, as promised here is the post on homemade paneer with the step by step pictures. Because the lighting in my kitchen is not too great, the pictures are not great either, but I hope it gives you all an idea of the process and the steps. For those of you unfamiliar with this event, the whole premise of Tried and Tasted is that each month a blog is chosen and participants try something from that blog. Hop on over to Janet's announcement for more details on this event. The first step is to prep your colander. Place a colander such as this one, on a large heat safe container. The container should be large enough to hold all the whey when the cheese is strained. Line the colander with a thin cloth, something like a muslin cloth or cheesecloth. In a large heavy bottomed pan, bring whole milk to a boil. The milk may rise a little before you add the vinegar/ lemon juice so make sure that the container has some room for that. I have heard that you can flavor the cheese by adding spices/ herbs to the milk at this stage so that the cheese will have some flavor. I have not tried it, mostly because I like my paneer plain and I find that unflavored whey is more versatile as compared to flavored whey. Continue to keep on heat, adding more vinegar or lemon juice if required until the mixture looks like this.... I used a total of 6 tbsp of vinegar+lemon juice for this quantity of milk. If the whey turns slightly greenish, then it means it is ready and can be removed from heat, if it is still milky then you need to keep on heat for a few more minutes. Place a small plat or flat object on top of the cloth and place a heavy object on top of it. I placed my marble mortar on top as it seemed to be the heaviest object in my kitchen.Let the paneer/ cheese drain for about an hour or so. If it is strained too long then it will lose its moisture and become rubbery, about an hour works out well for me. In an hours time, remove the paneer and place in a ziploc bag and refrigerate, or cut into cubes and use in any recipe of choice. You can store the whey in a glass jar/ bottle in the refrigerator and use it in making the dough for Indian flat breads/rotis/ phulkas, the rotis and phulkas end up becoming very very soft this way. I even use the whey in my chutneys instead of water when I am grinding the chutneys.